Today I had the pleasure of chatting with author, Keith Weaver, the mastermind behind “The Nefarious: Prince of Shadow”. I “met” Keith via a Facebook Group – KindelMojo. Thank you Keith and welcome, I am very excited and honored that you have accepted this interview. I have read great reviews of your book. Diva: Can we first start by learning a little bit about you? What would you like people to know about you that we probably don’t know? Keith: More importantly than being a writer, I’m a husband and father first. I spend a lot of my time with my family, especially my boys who are 6 and 4. I’m very immature, so I fit right in with young kids playing, wrestling and chasing. I also love sports, and stay very active with basketball leagues and MMA training that I do for fun. Diva: Please tell us about your book. What’s it about? Keith: My book The Nefarious is my first, and is a supernatural horror book. It takes place in a castle where 300 years earlier something tragic and evil happened. Now, in modern times, a film crew uses the castle to shoot a movie and unleash the old curse, and everything goes downhill from there. I provide a bit of a twist at the end as well! Diva: Where did you get the inspiration or idea for this book? Keith: I really got into horror in high school and college. I would watch any horror movie, no matter how bad. Some of the inspiration comes from reading the works of Stephen King and Clive Barker. I also took inspiration from movies; such as the long time curse in The Exorcist and the castle idea kind of stemmed from Jeffrey Combs’ Castle Freak. It really was a culmination of years of reading and watching, and thinking I could do that, too. Diva: How did the title of your book come about? Keith: I wanted something simple that just snapped off the cover, so I searched for words that had to do with evil and saw nefarious. That seemed like the perfect title, short and sweet. Diva: Which of your characters are the easiest and/or the most difficult to write about and why? Keith: I would say Kate, the wife. It was easy for me to write about her, because she really was the voice of reason in the story, and I found that an easy task to handle. However, her character was also very difficult for me. When things started going wrong and her husband seemed to be slipping away, I struggled with the emotional side of her and tried my best to portray her fear and her anger at the same time. Diva: What is your favorite book, who is your favorite author, what is your favorite genre–and why? Keith: My favorite book is The Phantom Tollbooth by Norton Juster. It was a favorite of mine, probably my first real favorite book as a kid that I still love today. Even to the point that I have the movie as well. My favorite author right now is Simon R. Green. I enjoy his Nightside series and have read them all so far. As far a genre goes, probably a toss-up between fantasy and horror. Fantasy was my first love, have always enjoyed others like Alice in Wonderland. I gravitated to horror in my teen years and haven’t looked back since. Diva: What are you currently reading? Keith: I’ve met a good group of authors recently, and I’m trying to get through at least one of every author’s works. It will take some time, but I’ve read a few so far that are great, but currently I’m working on The Black Witch by Michael Rivers. I have reviewed the books I’ve read, so readers can always check those out or contact me and ask what I have enjoyed. Diva: What is the next or current book/project you are working on? When can we expect it? Keith: I am currently working on a YA fantasy novel titled Nebulous. I got the inspiration for this from my boys, and took a lot of things they like and molded them into a world of my own creation, should be great! As a matter of fact, it will be out this year. I’m hoping before Thanksgiving, but definitely before Christmas. Diva: Do you have any advice for other writers? Keith: Stay committed to oneself. I mean this in two ways. Stick to your guns when it comes to writing style. The whole process of writing can be exhausting, so you should enjoy what you’re doing first and foremost. Second, stick with the networking and promoting of oneself. I haven’t been at this very long, but I’ve already tasted the trials of doing just that. I can’t even come home after work and take a night off without doing some writing, tweeting or networking, just doesn’t feel right to miss a day. But balance your time; I still have plenty of time for my family and other activities. Keith thanks so much for taking the time to chat with me here at the ReadingDiva’s Blog. Your book is the perfect Halloween read. 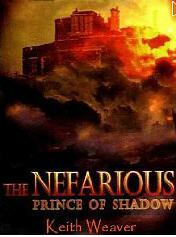 Readers, if you can’t wait to get your hands on “The Nefarious: Prince of Shadow” buy it here. If you want to learn more about Keith, check out his website http://www.aboutkeithweaver.com & Keith’s Facebook page. Thanks so much for the comment, it has been so much fun getting to know so many great authors and reading their work. Thank you again Keith for accepting this interview! Wonderful to ‘meet’ you, Keith! I have to say all this reference to the castle brings me back to the memory of being entranced with the creepy yet fascinating architecture of the castle/mansion in the movie “The Haunting” (1999 version) & my significant other teasing me for the insanity of that fascination. He’s not quite as into paranormal creepiness as I am but, insane or not, he’s still here. 😉 That definitely intrigues me about “The Nefarious”, though. It’s refreshing to see a published author say that you have to make the time for family, friends, etc even though you’re also obligated to tap the keyboard for awhile each day. That balance is something I definitely need to learn & I’m still in the ‘aspiring blogger’ stage, not even the real writer stage yet. Seeing that coming straight from one who is published makes me realize it can be done without everything becoming overwhelming. Thank you, Keith. I appreciate that tidbit of advice more than you could imagine.